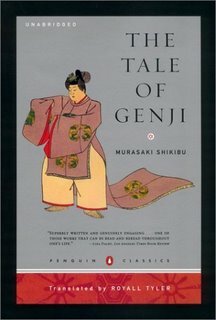 Penguin has an exceptional website devoted to their new edition of the edition of The Tale of Genji, and I can't possible do any better than to simply encourage you to go there and be introduced to its glories for yourselves. The cost, I believe, is about fourty dollars for a book that is as bibliographically beautiful as it is artistically superlative. Often, of course, choice between editions is a matter indifferent. In this particular case, however, so much rests on the skill and artistry of the translator, and -- oh joy! -- Royall Tyler has surpassed the hopes of even the most optimistic Genjiphiliac. About the book itself, click here. About the translator, click here. A brief essay of welcome from Royall Tyler is here. E-text of the book's Introduction, arranged as hotlinks to each section, is here. Chapter One, in portable document format, allowing you to see the beauty of the layout, is here.